Hardscape Products - Shaffer Block & Concrete Products, Inc.
Hardscape Products with a Rock Solid Reputation! Shaffer Block & Concrete Products is now a master distributor for LibertyStone Hardscaping Systems. LibertyStone is one of the largest manufacturers of drystack retaining wall block and concrete paver brick in the Northeastern United States. They manufacture the complete line of CornerStone Wall products as well as Mesa Block and Keystone Wall Block. They have a large selection of colors to choose from in both solid and blended colors. Block sizes range from the small garden wall to the larger square foot face unit. There are block available for near vertical or set back construction as well as double-face tumbled block for freestanding walls that are finished on both sides. LibertyStone also manufactures concrete paver brick in traditional sizes with smooth or textured surfaces as well as a true tumbled paver. The pavers are all made in the same colors as the retaining wall block. You know that your pavers will match your walls because they came from the same manufacturer. Shaffer Block is also a dealer for concrete paver brick manufactured by Hanover Architectural Products. Hanover has specialized in the production of high quality concrete paving products and concrete wallstone products for over thirty-eight years. Hanover's extensive line of concrete paving products truly completes your home and landscaping. They offer a line of small hand held brick to larger scaled paver slabs. Hanover's products are available in a wide selection of sizes, styles and colors. No other company can offer the superior quality and complete selection of pavers, bricks and walls that Hanover can. Their reputation stands solid with product performance and service to their customers. 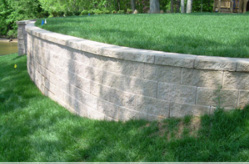 Shaffer Block stocks a complete line of products used with concrete pavers and retaining wall block. We have plastic edge restraint, spikes, polymeric joint sand, paver sealers and srw/paver adhesive. We also stock geogrid and landscape filter fabric.